It's Slotland's 19th birthday this month! One of the world’s oldest, most popular and unique online casinos, Slotland is celebrating this momentious occasion with a series of casino bonus offers and they'll be launching another new game this month. To start the birthday party there's $19 freebie and a choice of match bonuses are available until this Sunday. There’s a Game-of-the-Month contest as well, and the casino will also start accepting Bitcoins in a couple of weeks. Back when Slotland started, the internet was brand new and no one would have thought we’d soon be banking and shopping online. It was really hard to believe you could play real money online slot games on our computers. More bonuses, a new game and Bitcoins coming during 19th birthday celebration. These bonuses can be used to play any slots, table games or Keno (except as noted). All active player accounts are automatically credited. 20X wagering requirement, 6X max. cash-out (VIPs 12X). 13X wagering requirement; may be claimed up to 5X. 13X wagering requirement; may be claimed up to 4X; valid for video poker only. 19th Birthday Bonuses are available until Sunday, October 8 only. Players will be notified by email of more birthday bonuses during the anniversary celebrations. 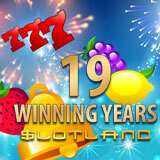 The Grande Fortune slot is the Game of the Month during Slotland’s 19th birthday party. Every 100 spins on the retro-style fruitie earns one ticket in the month-long contest. The first place player will win $300; second and third place players get $150 each, fourth and fifth place win $100 each and the next five will receive $50 each. Until the end of October, a 70% match bonus for Grand Fortune (only) can be claimed up to twice a day using bonus code GOTM70. Reminiscent of a fifties-style juke box, Grand Fortune, has traditional slots symbols like Cherries and Lemons and an expanding Wild on its five reels. Bars trigger up to seven free spins with up to 7X win multiplier. Five Bars with a minimum $20 bet wins Slotland’s site-side jackpot which is currently over $115,000. Slotland has been importing games from its partner site, WinADay Casino, for the last few months and this month it will bring the immensely popular Chinatown slot game to Slotland players. Chinatown features an Expanding Wild and a bonus game that awards up to fifteen free spins.